The show is on, the work is up. Who knew we could pull it together in the end? We even had our doubts at times, but that didn’t stop us from putting in our best efforts. I’m not just referring to myself in the plural sense rather my family. If it wasn’t for their support and grace, I don’t think I would have managed getting my art work done and hung in time. Each of them has played a role. My daughter, Haven, provided me with the initial inspiration by being my muse. 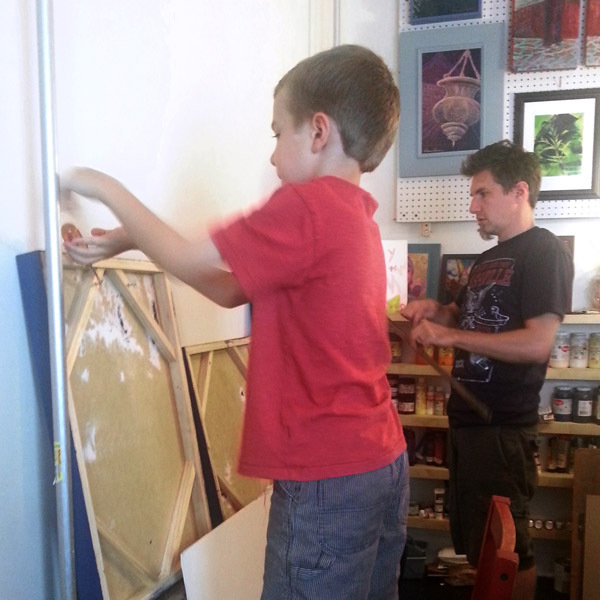 My son, was recruited by my husband to help get each piece ready to be hung, a way to spend quality time with each other and also manage to still get some work done. And, my dear servant of a spouse has helped me build frames, pour resin, attach hardware, and hang each piece thoughtfully on the wall of Carroll St Cafe, a local village establishment. That famous saying, “It takes a village to raise a child…” Well, I feel something similar applies here, “It takes a village to pursue being an artist and a mother.” Someone asked me the other day when I had the time to make art, especially enough for a show. My initial response, “I’m not really sure.” Yet, thinking about it in more depth, I was reminded of the supportive roles each of my family members has played. This whole art career is not just about me pursuing my vocation of choice, but it is about a way of living life which involves those living alongside me. If I had tried to keep my art making only for myself all these years, I’m pretty sure that my art pursuit would have had a slimmer chance of surviving the mommy years. I had to come to realize that I can not do this on my own (maybe some women can), I have to ask for my family’s help. We haven’t had the luxury of a budget that allowed childcare so I could lock myself in the studio for hours on end to pursue a “vocation”. Therefore, I have had to be passionate and determined enough in seeking out a way for this dual pursuit of being a mother and a practicing artist to work simultaneously as a way of life. Even if I had all the logistics miraculously planned out, creating art consistently still wouldn’t happen unless my family was truly on board with me. And because my family IS on board with me, it becomes more of a family pursuit and accomplishment, and less of a personal gain only. Now, my 6 year old knows the concept of studio time and respects it. When he comes home from school, he drops his backpack and comes running into the studio to re-connect, because he knows that is where he can find me. He gives me a quick summary of his day, before going elsewhere to play. This is not an interruption, but the evidence of a greater understanding; he knows where to find his mom, how she invests her time, and that he is welcome in. Not only that, he now knows what it means to pour resin and to wear protective gear in the process. All of this to say, I was not by ANY means born a saintly and unselfish artist. I have struggled many years to find this more peaceful state of being and have come to realize that much of it has had to do with an attitude change on my part. One that for many years looked more like my artist self making all the sacrifices for the sake of family. Yet, look now, how the tables are being turned and my family is the one blessing and supporting my artist self. I would have never seen that coming. This village of ours also extends to the neighborhood around us; from the support of this local venue to the people who grace our lives daily and have supported the art show and our family by their presence. You know who you are; neighbors, school teachers, free baby sitters, our daughter’s therapists, fellow artists, and friends. We hope our collective investment as a family will touch you in return.